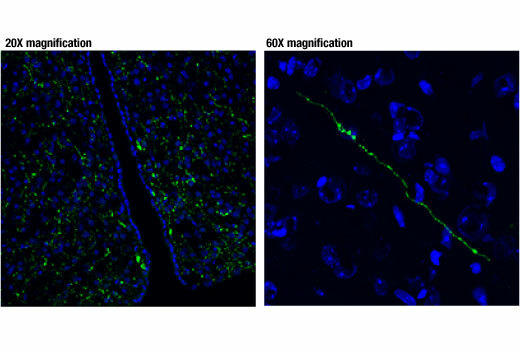 Confocal immunofluorescent analysis of the hypothalamic region of normal mouse brain (left) and a magnified image (right) using Vasopressin (D8T3K) Rabbit mAb (green). Blue pseudocolor = DRAQ5® #4084 (fluorescent DNA dye). Vasopressin (D8T3K) Rabbit mAb recognizes endogenous levels of total Vasopressin protein. Monoclonal antibody is produced by immunizing animals with a synthetic peptide corresponding to residues surrounding Pro155 of human Vasopressin protein. Vasopressin is a neuroendocrine peptide that is released to the circulation by magnocellular neurons whose cell bodies are mainly found in the paraventricular and the supraoptic nuclei of the hypothalamus. It was first isolated from pituitary gland extracts and synthesized in 1951 (1). Vasopressin acts by activating G protein-coupled, V1a, V1b (also known as V3) and V2 receptors and plays a fundamental role in the maintenance of water homeostasis. One of its main functions is body water retention (2), hence its alternative name antidiuretic hormone or ADH. Vasopressin also leads to increased arterial blood pressure by raising peripheral vascular resistance (3). Vasopressin is also involved in other physiological processes such as acute heart failure (4), pain (5), and metabolic syndrome (6). Turner, R.A. et al. (1951) J Biol Chem 191, 21-8. Robertson, G.L. (1976) Recent Prog Horm Res 33, 333-85. Aoyagi, T. et al. (2009) Kidney Int 76, 1035-9. Gilotra, N.A. and Russell, S.D. (2014) World J Cardiol 6, 1252-61. Luttinger, D. et al. (1984) Int Rev Neurobiol 25, 185-241. Saleem, U. et al. (2009) J Clin Endocrinol Metab 94, 2558-64.